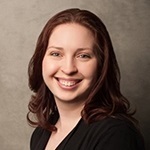 Tabitha Seldomridge joined Alchemy Financial Group in January 2014 as an executive administrator and helps manage the day-to-day administrative needs of the office. Tabitha’s duties include: preparing advisors for appointments, creating and organizing account review paperwork for clients, helping with client events, and offering general support to the staff. Tabitha holds degrees in both Human Resources and Business Management from Columbia College of Missouri. Tabitha lives in Elgin with the husband. In her free time she enjoys spending time with family, baking, cooking, playing with her dogs, and reading a good book.